In June 2010 I reported that John Todd had sold the 25.9m motor yacht Bella Una II for sale and now John tells me she's been refitted and is back on the market called Lady Sarah. Built in 2001, she's a great example of Burger’s craftmanship, and was designed in collaboration with Don O’Keefe and Douglas Richey. Her interior is “classic contemporary” with traditional accents and superb Makoré woodwork. Lady Sarah accommodates 6 guests in 3 staterooms: an independent full-beam master suite and two double cabins. 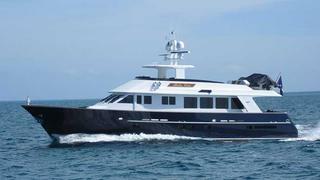 Lady Sarah is asking $3.75 million.